[In the main the BBC is unbiased] … However, there was one exception. Others drew it to our attention â€“ an article in the Scottish edition of the Daily Telegraph was headlined â€˜Fibs about Scotland on the BBCâ€™ â€“and we could observe it for ourselves. It concerns the question of whether or not a group of people collectively called â€˜the Englishâ€™ â€“ and, in particular, people called â€˜English taxpayersâ€™ â€“ do, or do not, â€˜subsidiseâ€™ a group of people collectively called â€˜the Scotsâ€™. We were not in a position to monitor the BBC networkâ€™s entire output on this issue, but some of the coverage could give viewers and listeners the impression that there is a known and settled answer to this question and that the known and settled answer is that the English do, indeed, subsidise the Scots. There is a very real and strange assumption that there is a subsidy as the BBC has asserted in various media several times. Perhaps no small part of the reason for the arguments to fail to advance towards anything resembling a resolution is down not just to Treasury intransigance but also a misinformed electorate, and possibly also politicians. Just remember, that’s the Daily Telegraph (scots edition admittedly) pointing out to the BBC how to be fair and accurate in reporting on Scotland. Questions of BBC bias are not as simple as Tory or Labour anymore, as my MP would do well to learn (p.s. Greg as you ask more written questions than the average MP, perhaps best not to lay into a journalist for asking questions themselves). The events in Wales were important. They were obviously important for the people of Wales; the Welsh National Assembly has a wide range of devolved powers and controls a budget of Â£14 billion … However, the BBCâ€™s UK-wide network, as distinct from BBC Wales, had little to say about any of these developments … Network news did, however, take considerable interest in another story emanating from Wales during the same May-July period. It concerned Shambo, a six-year-old Friesian bull. It’s noted elsewhere that many in the BBC audience believe that often their local area was more likely to be covered as a quirky local interest story than anything of genuine note. To be fair, there are millions of people in the UK, most of them in England, who have also failed to grasp, or even to notice, the scale of the changes that have taken place. To judge by what they say on television and radio, some of them sit on the green benches at Westminster, including the front benches. Indeed, King notes that Ministers at Westminster are deliberately failing to append (of England (& Wales) (& Northern Ireland) to their job titles. He reckons journalists should do their best to make such things clear, though he also notes that our devolved system could hardly be more complicated and he reckons only a “select few” understand the Barnett funding formula, for example. In our travels, we noticed, for example, that not all of the newsrooms we visited had maps of the UK on their walls. My workplace is littered with UK Maps, indeed it seems you can’t be a director without having one somewhere. Personally I sit typing this with a large map of Scotland behind me, but I’m just a tad biased, and I have some London maps as well. All in all, a great review, and now we must hope that good things come from it. 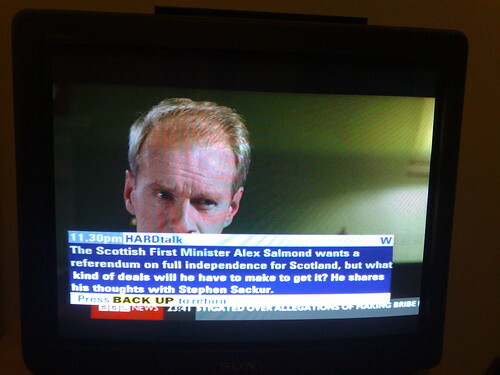 This entry was posted in General and tagged news, politics, scotland on June 11, 2008 by Alex. Erm, right. I didn’t think that would happen. So what’s Wendy Alexander up to? Apparently she’s listened to people. Now, it’s a fine time to finally listen to the people, after the SNP have been in power for a year. Maybe this is Brown finally cracking to a demand Wendy has made many times since taking power, certainly it doesn’t fit that Wendy would just come up with this and then be able to announce it. Wendy claims the SNP are talking too much about independence without wanting to have the referendum. She’s even slated them for delaying the referendum, but in a way that showed she was basically unaware that the referendum was committed to 2010 in their manifesto. Further, Salmond himself was quoted a few days ago as saying that independence is not the matter in hand just now. Only thanks to Wendy is that the case. There’s no turning back now, there will be a Scottish Independence Referendum. To steal Mr Dewar’s words. I Like That. Shame the question will be a complete pain though. How on earth are Labour going to help draft a question? How can they do this positively? Wendy herself has ruled out a referendum on Calman Comission’s proposals, but she can surely change her mind on that – I’d hope for the sake of political sanity that she does. The SNP, of course, already have their question out there, and more in the white paper that kicked off the national conversation. Indeed they’ve described a potential devolution max option which may well be what Calman and his commission deliver. No-one wants to campaign for the status quo, and Labour are on a hiding to nothing if they have nothing positive to offer Scotland. A failed yes/no to independence referendum will not be an achievement for Labour, nor will it be the undoing of the SNP. It just confirms the position for a generation. No more, no less. Meanwhile as I type this News 24 (up to the minute news from the BBC) are repeating a fascinating HardTalk interview with Alex Salmond. I’m guessing they recorded it on Friday or Saturday. It seems a fragment of history already. This entry was posted in General and tagged politics, scotland on May 6, 2008 by Alex.